Just so you know, this is the first commercial jig I’ve ever used like this. I’ve never cut a box joint before in my life. In other words, I’m a noob. I ordered the Woodhaven 4555 Box Joint Jig from Amazon for $59.99 on 3/26/2011 and received it in Phoenix on 4/1/2011. I purchased it from Amazon rather than directly from Woodhaven because the shipping was free but now I see Woodhaven ships free on orders over $50 (according to the catalog that came with the unit). I looked at a few other jigs but they were either about twice as much or (one of the Rockler jigs) used a lot of plastic and had reviews that it flexed too much. This one has a long aluminum fence with a laminated MDF fence, aluminum guide pins, and attaches to your existing miter. 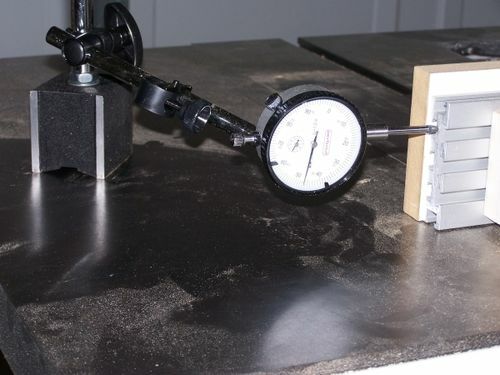 It can be used on either a table saw with a dado blade or on a router table that has a miter. Assembly was pretty straight forward for the jig itself. However, I didn’t know that it recommended an additional sub fence mounted to your miter. I have the Craftsman 22124 and stock miter, and this jig would not fit the miter. I made an “adapter” for the jig. It wasn’t terribly difficult to make but I wanted to start using the jig right away and this was one of those things that had to be done first. I made the adapter out of some poplar that I already had machined. Once I got the adapter done I tried using the jig. It’s not that easy, or at least it wasn’t for me but then no one ever accused me of being a brain surgeon (which I’m not, BTW). I wanted to use this on my table saw because I already have a Freud 8” dado set. I didn’t have to order a new router bit; I got to use my new (to me) table saw; I am not sure my little Bosch router table is big enough and I don’t have a miter that fits well in its slot. So, I initially tried setting the dado at 1/4” and setting up the jig for 1/4” slots. First, from the directions, I thought the spacing of the two aluminum “keys” were important so I was trying to get them to be exactly 1/4”. Then, I made my first cut and found that the actual dado is a bit undersize. So I spent time trying to get the aluminum key sections to measure to the exact width of the cut. I tried a few pieces, adjusting things, and got the pieces to line up a bit but it took quite a while making a few cuts on two different pieces and then trying different adjustments. I got tired of making a lot of small cuts so decided to try the dado at 1/2”. However, the stock zero clearance insert (ZCI) wouldn’t work with that setting (it DID work with the 1/4” width). I tried one cut without a ZCI but didn’t like making it. I was able to hold the piece to the fence but I didn’t like it and decided I wasn’t going to do that. So, I made a trip to Home Depot to pick up some 1/2” MDF to make an insert which you can see in the picture. I don’t know how others do their home made ZCIs, but I put a finger hole in it similar to the stock unit, and added a hole for screwing it to the table. I also put 4 wood screws in the corners for adjusting it like the stock ZCI. I’m pretty happy with it and will make another for the normal blade when I’m done with this jig. But, it was another delay in the middle of trying to work with my new jig. I also scaled the 1/2” back to 3/8” and decided that would be a good size for me. It’d be one less cut for every two of the 1/4” cuts but not so big as the 1/2” which just didn’t look that good to my eye. The ZCI was cut using the 3/8” width. I finally realized the setting of the two aluminum pieces isn’t important either. They just need to be fairly snug but after you make a cut with the dado you can use that cut to set the aluminum keys so they are snug by placing the cut over the keys, spreading them to get the desired fit, and tightening the movable key section. The important adjustment is the distance from the right edge of the blade to the left edge of the fixed key section, as viewed from behind. That distance must equal the width of the cut. Once I directed my attention to that, I used my Grizzly dial caliper to adjust the fence. I looked at the difference between the width of the finger and the slot. Using the dial caliper I moved the fence left/right as necessary the same distance that the finger was short or over the width of the cut. That made the process pretty easy once I used my new caliper (it attaches to the table with a switchable magnet so it’s pretty easy to move on/off the table). Once the adjustments were done, I made a few test cuts. My first “box” (unpictured to protect the innocent) was a learning process. It looked like crap. After a few more adjustments I made one more joint which I’ve pictured here. It’s not bad. It’s also not glued, but was sanded, but due to the lack of glue the sanding isn’t perfect. I figured out how to keep the grain matched up on the cut, as you can also see (although its not quite the same as if it had been a miter cut). Once again, I’ve learned that just buying a tool doesn’t mean you can make boxes like Mic! Good solid unit at a decent price. Aluminum keys should not wear out. Can be used on a table saw or router table. Should produce repeatable results once set up. Supplied sacrificial fence is reversible and has two sets of mounting holes so you can use all 4 corners. Need additional mounting piece (the hardware was included with the unit). I’m not sure if I can cut more than one piece at a time due to the short keys (Mic cuts multiple sides at once). Included instructions for use are pretty bare but there are examples online. Setup time is lengthy but it probably is for all jigs of this nature. Yeah, I gave it 5 stars. I’m not sure how it could be any better unless it had it’s own dial adjustments. Thanks Eddy – Now ya tell me! I only made the one. I’ll try some plywood when I need to make another one. Other than that it seems to be working fine. It seems that you had quite a time getting it adjusted. One of the big problems with a jig like this is repeatability. After you remove it from your miter gauge and reinstall it, how hard is it to get it back into adjustment? Seems from your problems that 5 stars is not quite meritted. Just a thought. 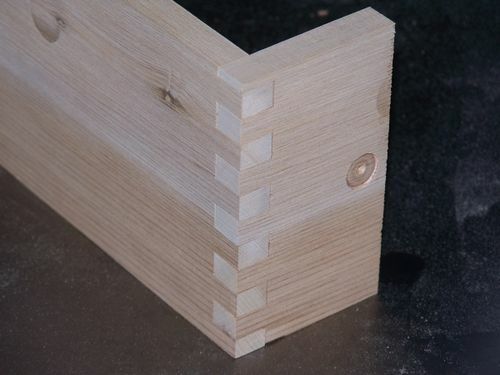 The other thing about box joints, making one corner is way different than making a whole box. I’d be interested in seeing your 2nd box after you install it on your miter gauge for the 2nd time. Thanks for the review. Thanks rance – I don’t think removing this jig and replacing it back on the miter should be a factor (but, I’ll see!). There’s not much on the jig itself that moves (just the pins that fit into the notch). It’s the placement of the jig on the miter that counts. I really think that using the dial indicator is a pretty quick way to get it set up, but again, if I don’t use it for months, I’ll probably have to go through another learning curve (unless I write down some notes but who knows if that’ll happen!). The 5 stars may be a problem. I don’t know. Personally I pay very little attention to the stars on reviews but try to get a feeling for a reviewed piece of equipment from the text. On the other hand, I think this unit does what it says it will and I don’t see any issues with the jig, either on its own or by looking at other jigs online. Thanks Mic. I know you do yours on the router table. This jig will work on a router table too (in fact the “usage” directions that come with the jig only describe the router use). I haven’t tried it yet but I’m going to try sticking two or more pieces together with spray adhesive to try to cut more than one piece at a time. 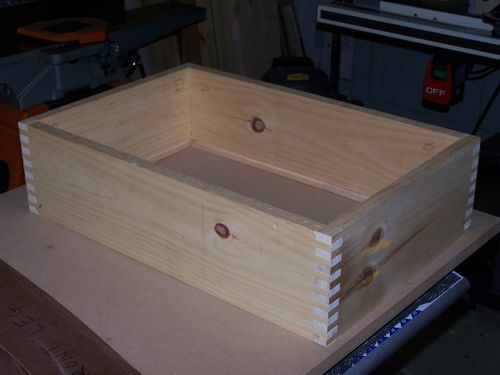 For my “saddle caddy” project there are two drawers that are identical and which I’d really like to cut at the same time. That’s a nice box there Randy. I too like the knots. And thanks for the followup info. From one Phoenix woodworker to another, thanks for the review. Now that you have used this jig, do you think you could have built one yourself? I saw Norm make one on NYW and I thought I could copy, but it wasn’t as easy as I thought. I would love to get your feedback. Again, nice review, and a nice box. You getting ready to shut down for the hot summer, or are you working through? Dwain – I considered trying it but I read about other’s attempts and decided not to. If you make it yourself and make the key or pin out of wood it will wear. You’ll have to do something about it at some point. I didn’t see an easy way to make an adjustable key. If you make it out of MDF or Ply it will be cheaper, especially if you already have the material laying around. If you make it yourself you can make it the size you need. I looked at a number of jigs and this one just seemed to fit the bill. It’s not terribly expensive and if you order it from Amazon the shipping was free. It’s from aluminum. It has adjustable keys or pins. The only issue I see, and I haven’t tried to do it yet, is if you want to try to cut multiple pieces at the same time. The Rockler router table jig allows you to cut multiple pieces at the same time. Mic uses a different jig and he can cut a number of pieces at the same time. That’s a great feature, even when doing a single box. You could do both ends at the same time and both sides at the same time, ensuring the cuts match. rance – Your comments have been in the back of my mind since reading them. I had an occaision to remove the jig from my saw and then had to mount it again to make some additional joints. It re-installed and cut the joints without ANY additional set up other than adjusting the blade height. Note that the sub fence just mounts back onto the miter and there isn’t much slop there. I had NOT changed the cut width, nor had I taken the dado blade off the saw. Either of those could impact the cuts. Next time I use it (I’ve now pulled the jig and blade off the saw) I’ll update this again. But my in experience so far, as long as you use the same cut width each time, repeatability with the jig doesn’t appear to be an issue. Thanks for pointing this out!